Nestled in a New Hampshire hillside, Saint-Gaudens National Historic Site is just the place to go to forget the hustle and bustle of daily life. 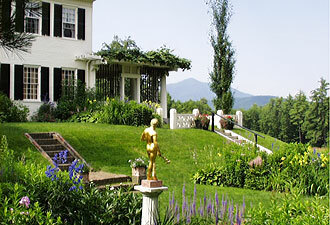 Breathe in the clean, crisp air; close your eyes and listen to the sounds of nature; or pause to take in the view of Mount Ascutney, and you may be able to get a sense of what drew the renowned sculptor Augustus Saint-Gaudens to this idyllic country retreat, which he eventually made his fulltime home. Garden enthusiasts will delight in a profusion of flowers in the site’s several gardens. The formal terraced garden with its period plantings is set off with gilded casts of ancient sculptures. The cutting garden offers a wide variety of flowers grown for the dazzling arrangements found in the galleries and other buildings. The 195-acre site is surrounded by woodlands, and you will find two miles of nature trails that meander through the forest along the Blow-Me-Up Stream, the old swimming hole, and ravines left by glacial lakes. And if the lush landscapes and almost continually flowering gardens are not enough, there is the sculpture, of course. Wander in and out of buildings and gallery spaces to discover the site’s true star – the art collection. 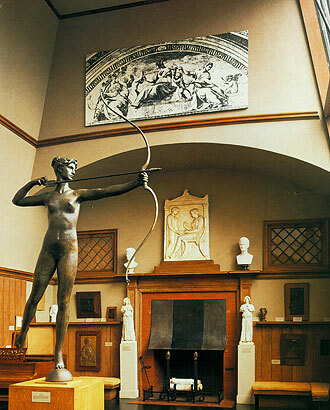 Saint-Gaudens won fame as the foremost American sculptor of his time. Sculpting between the 1870s and the early 1900s, he produced some of the most well-known and breathtaking pieces of sculpture in the United States. With more than 100 Saint-Gaudens pieces on display, you’ll certainly find a way to keep occupied. Admire the stunning gold coinage, the heroic and emotional Shaw Memorial, and the pristine and provocative Diana figure. Many of Saint-Gaudens’s works capture the audience and refuse to let go. If you visit during the summer, you can also enjoy a concert or indulge your inner artist during a sculpture class. On Saturday afternoons throughout the season, the sculptor-in-residence teaches a range of sculpting workshops. 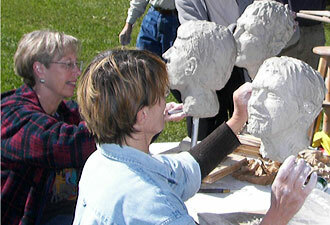 Participants can create a portrait relief, a design for a new coin, or a figure in the round, and then learn to make a mold and cast the piece. Sunday afternoons in the summer yield a series of concerts sponsored by the Saint-Gaudens Memorial, following a tradition of Saint-Gaudens himself, who held concerts in his studio. Bring a picnic; Sunday afternoons are perfect for a lazy meal on the lawn. Do not worry, however, if your visit to Saint-Gaudens National Historic Site is delayed until the fall. Then you’ll be treated to unbelievable vistas as the foliage changes. During the yearly march from late summer to fall, the background of the site changes from verdant summer greens to an explosion of fiery reds and oranges, tinged with subtler browns and yellows. It makes for some stunning visuals, which only enhance one awe-inspiring trip.